At Discovery Point Prominence Point, we know how important it is for children to have opportunities to make new memories and build relationships in the summertime. Our summer camp in Canton offers plenty of avenues for creative expression and skill development while ensuring that kids have a blast every single day. We’ve designed our “Mighty Me!” program to encourage campers to hone in on their unique superpowers and develop confidence in the process. We also impart important life lessons through engaging literature selections that tie in with our themed activities and excursions. Who says learning and fun aren’t interdependent? We want children to be able to take a break from the day-to-day routine of the school year while continuing to learn and grow in a fun, inspiring environment. Our program is structured with a basis in literature to keep children working on their language development and literacy skills. 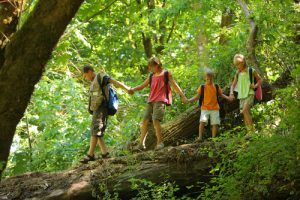 We then take the lessons campers are learning through these stories and apply them to real-life situations in the form of exciting hands-on activities and adventure-fueled field trips. Self-esteem. We show campers that being a true superhero is about gaining the confidence to embrace your own talents. Friendship. As our campers socialize with one another and build relationships, they learn about the roles that kindness and respect play in friendships. Sportsmanship. Teamwork and fair play are two aspects of sportsmanship that we hit on during our fun competitions both on and off the field. Critical thinking. Brainpower is celebrated and sharped through challenging games and puzzles that help children build important skills they can use in school and in life. Creativity. Campers are shown how the visions in our imaginations can lead us to create incredible things in real life. Self-reliance. Children learn about being resourceful and making an adventure out of everyday situations. Physical fitness & health. We encourage campers to embrace health and fitness so that they can accomplish amazing feats. Learn more about the adventures we have planned for our summer camp in 2019. Contact Discovery Point Prominence Point at (770) 720-8682 or visit our child care center today for details about our summertime offerings for children in the Canton area.